The Daniel O'Connell round tower at Glasnevin cemetery. Completed in 1869, interior bombed in 1971, stairs to be rebuilt in 2014. VISITORS TO THE O’Connell round tower monument in Glasnevin cemetery will soon be able to climb to the top for the first time in over 40 years. The winding wooden staircase that once ran up the centre of the 168ft-high tower was bombed to pieces by loyalists in 1971. TheJournal.ie has learned that the Glasnevin Trust has secured planning permission to reconstruct a wooden stair that will provide access to the four windows at the top of the tower. These face north, south, east and west and as Glasnevin already lies 110ft above sea level, the view spans from Meath to the Dublin mountains, and up to mountain ranges in Louth. Construction is expected to begin in about two months’ time. Shane MacThomais, resident historian at Glasnevin cemetery, told TheJournal.ie that the timbers to be used for the stairs have already been cut and are being seasoned so that they won’t contract or expand to any great degree when in situ. Enough of the estimated €500,000 building cost has been raised to begin the process and the Trust is hoping for funding from the private sector for its completion. The design of the new stairs will be a double helix to allow visitors to go up and down at the same time. When it is complete, along with a platform at the top, between six to eight people should be able to take in the view from the top at any given time. About three years ago we did an evaluation of the tower – an architectural and engineering survey. We put a ladder up the side of it last year and I got to see the view from the top. It’s spectacular. 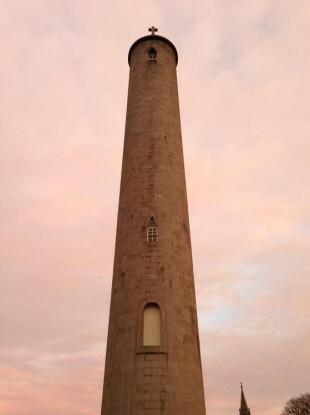 Glasnevin is 110ft above sea level and the tower measures 168ft high on top of that so you can see all the way out to sea, to the Wicklow Mountains, up to the Cooleys or Mourne Mountains to the north and across the land to Meath. Shane MacThomais taking in the view at the top of the tower last year. Image: Shane MacThomais/Glasnevin Trust. As the building is a listed structure, the design has to stay relatively faithful to the original staircase. However, the engineers must also add handrails and other safety features to satisfy modern building demands. “We’ll be giving it safety features that it didn’t have 150 years ago,” said MacThomais. The tower itself survived the blast, thanks to the three-foot-thick granite stones of its construction. However, with the windows and stairs blown out, it was sealed up, including the crypt at the bottom which contains the sarcophagus of Daniel O’Connell and the remains of several members of his family in a side chamber. The landmark was one of three blown up by loyalists in Dublin in January 1971. These landmarks were considered icons of Irish nationalism – the Wolfe Tone statue in St Stephen’s Green which was completely destroyed, the O’Connell statue on the city’s main thoroughfare, which survived; and the round tower in Glasnevin, built in memory of the Irish politician remembered as the ‘Great Liberator’. The tower was built in the mid-1800s, around the same time as the Wellington Monument in Phoenix Park and Nelson’s Pillar on then-Sackville Street (now O’Connell Street). The building of the tower to commemorate O’Connell’s death, funded by public subscriptions and designed by George Petrie, was a “kind of a political move as well,” said MacThomas, “a Catholic nationalist monument pointing to the sky. Building on the O’Connell round tower began in 1855 and finished in 1869. Glasnevin Trust is governed by the Dublin Cemeteries Committee, a not-for-profit group established by Daniel O’Connell himself in 1828, with a remit “to bury people of all religions and none”. The museum at Glasnevin opened in 2010 and offers tours of the cemetery – you can read more here. The great-great-granddaughter of Daniel O’Connell, Ricarda Cunningham, with her brother Geoffrey O’Connell, at the O’Connell crypt in the base of the tower at Glasnevin in 2010 at the launch of the museum. Image: Julien Behal/PA Wire. Email “Bombed staircase in O'Connell Tower at Glasnevin to be rebuilt”. Feedback on “Bombed staircase in O'Connell Tower at Glasnevin to be rebuilt”.